DIY projects are always popular, so we’ve decided to throw another one into the mix. This particular little idea comes from a problem that many photographers have – where do you get a good, small, white/gray surface to use for white balancing your RAW shots in conversion? Problem number one – a good gray card comes with a price tag from around $20 up to potentially as much as $100. Not to mention that for some shots (like it is in a studio with multiple lights/reflectors) you may need several references for white balance placed in the scene. Problem number two: gray cards require delicate handling (no bending, no fingerprints, no dirt, no scratches, some can’t withstand moisture, etc.). What if you dropped your gray card into dirt in the middle of nowhere? Problem number three is that you have to actually set up a grey card, and that might be a hard thing to do – uneven surfaces, wind, anything that makes it difficult to put the grey card down or stand it up will make it difficult to use. We’re proposing an alternative that will save you time and money, as well as make you feel good for not buying into some inefficient, overpriced product of limited usability. So, welcome to LibRaw’s Wacky Cheap 5-Dollar DIY White Balance Reference Project. Step 1. Go to whatever store you have nearby that sells office supplies. Get a white/light gray rectangular eraser. Got it? Good. You’re ready for the next step. Step 2. 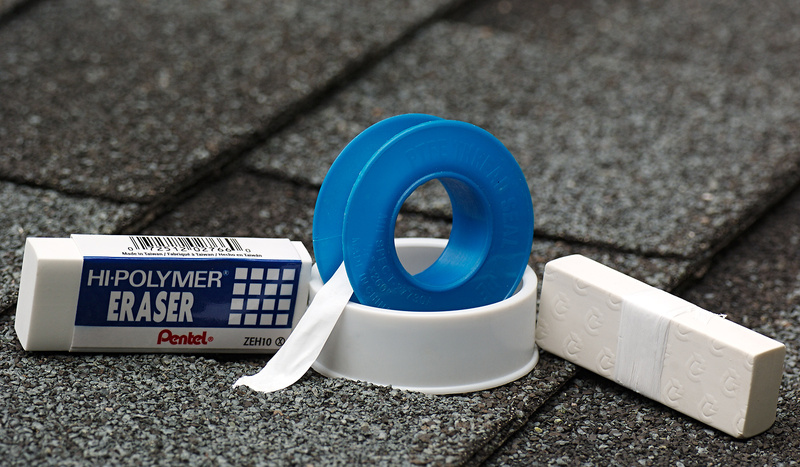 Go to any hardware/home improvement store and get a roll of Polytetrafluoroethylene (known most commonly as Teflon/PTFE) white matte thread seal tape. This stuff is indispensable when it comes to plumbing, you can find it everywhere in the world. Step 3. Tightly wrap the PTFE around the eraser several times – 4-5 times ought to do it, it won’t let through any light after that. That’s it. Your cheap, portable, easily-replaceable universal white balance reference device is done. For a demonstration of its use and effectiveness we’ve chosen a scene that will become (after a re-arrangement) a postcard for a friend – autumnal colors, fairy dolls, and our favorite brick wall. Consider 5 shots of the same scene taken under 5 very different color temperatures, ranging from warm incandescent, to very cool high in the mountains. The left part of each picture is the RAW, opened in FastRawViewer with the white balance set to “As Shot.” The right part is the same RAW, with a custom white balance established by clicking on our improvised white balance reference. The mouse cursor shows where exactly the white balance was taken from. As you can see, the scene contains an X-Rite ColorChecker Passport target. If in doubt, you can install FastRawViewer or use your favorite RAW converter, download the respective RAW files, and check for yourself that the white balance taken from the Passport gray patch is virtually equivalent to what we got from our eraser-Teflon tape setup, as can be seen from the comparing color temperatures, tints, or whatever other white balance readings your software provides. Incidentally, it’s not by accident that we’re suggesting using this particular material – sintered PTFE has been known to have high spectral purity, low opacity (that’s why 4 layers is enough), and a very diffused reflection with close-to-1 factor for many years. However, for obvious reasons, this has not been disseminated as public knowledge. To be pedantic, a little bit of technical information about this. We measured the Teflon tape, after it was already wound around the eraser, with a spectrophotometer. The picture below shows the results of said measurements as processed by SpectraShop. RGB values (the purple rectangular mark), demonstrating the neutrality in familiar units. As you can see, our Teflon tape has a reflectivity factor of Y=96.18%, that is the highest of all materials checked, L* = 98.5, a spectral purity equal to 0, and RGB values almost identical to one another - (250, 251, 251). The graph below shows that the spectral response of our DIY target is extremely flat. In most cases, the only things that are going to be brighter than the Teflon tape are a specular highlight or a light source, because the Teflon tape has a close-to-maximum achievable diffuse reflection. This helps when establishing exposure and maximum brightness in RAW conversion. The higher the values in the digital capture are, the lower the noise is. That’s why having a target with a higher diffuse reflection factor as a white balance reference ensures that the readings used by the click-on-neutral method are less contaminated by noise, less skewed, and generally more accurate. So, first, an hearty thumbs-up to this recommendation. PTFE thread seal tape is, spectrally, far superior to anything you can buy as a white balance accessorty -- with one notable exception. For about the price of a Canon L-series lens, you can get a Spectralon target that'll be spectrally superior, but consumer-grade equipment can't measure the difference. But the Spectralon is much larger and rugged and its surface is much more Lambertian. The PTFE-wrapped eraser is cheap enough that you won't even blink at the expense of replacement. ...but it's also not something you're likely to find laying around wherever you happen to be. And if your PTFE eraser gets stepped on or misplaced or what-not, that could be cause for panic, even if it cost you less than a cup of coffee. The good news is that, for no more than the price of a cup of coffee, you can get another great neutral reference: a styrofoam coffee cup. It's not as bright as PTFE, but it's (almost) as spectrally flat. And its conical shape can be particularly useful, as it will give you a sample of the light sources of any particular angle in the scene. Another potentially very useful feature of the cup is that, placed over the lens, it will uniformly integrate the light from the scene. In almost all cases, that's the best you're even theoretically going to get from any sort of automatic white balance option. And most cups have a transmission emount that's also pretty close to what the built-in meter is calibrated for. As such, you can often put the cup over the lens, take an autoexposed shot, and use the meter settings for the rest of the shoot and use the shot as the white balance setting. However, none of these methods is ever going to actually get the true, correct white balance. For that...ideally, you need a spectral model of the camera system plus a spectral measurement of the illuminant. And, either in conjunction as a refinement or as a stand-alone replacement, a good reflective chart sold for profiling is a very good idea. Using spectral math to balance channels is obviously beyond the scope of a comment like this. 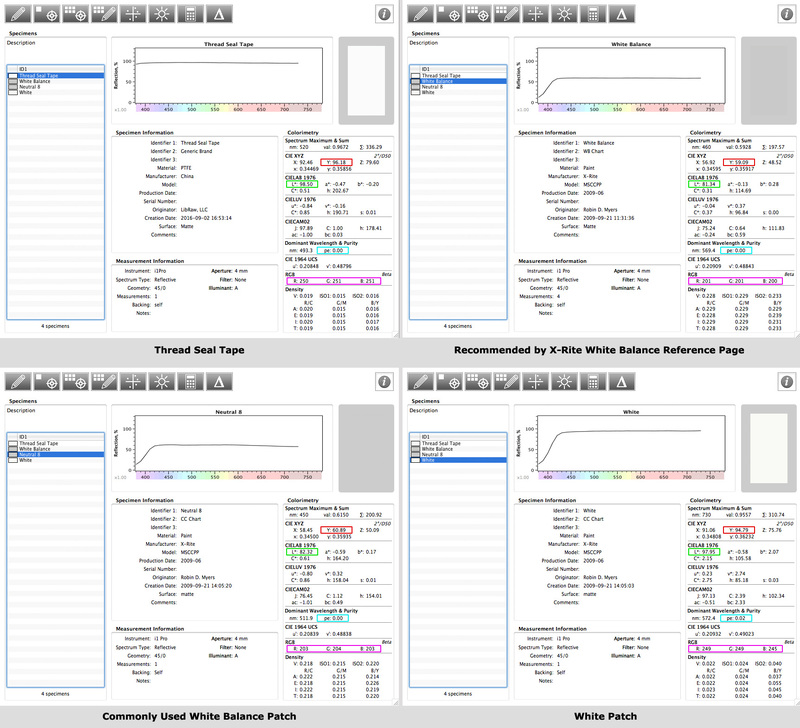 The idea of using a chart (and I'm inordinately fond of the ColorChecker Passport for this, though any commercially-sold chart will produce similar results) is that, rather than sample a single reflective spectrum that "should be" an integration of the illuminant, you sample a wide range of reflective spectra. Yes, a flat spectrum should result in R=G=B...but other spectra will produce other knowable R/G/B ratios -- and there's one channel balance that will minimze the errors for all of them. As a bonus, as will become obvious, at the same time as the profile tells you the balance, it also tells you the exposure adjustmnt. The end result is perfect white balance and exposure from any color chart. Wrapping technique may be a factor. I made one of these items. I noticed that there was a bit of specular reflectance. When I wrapped the tape around the eraser, I stretched it to make sure it would stick, and I think that may have been the cause. I made one more wrap minimizing the stretching and that seems to have done the trick.